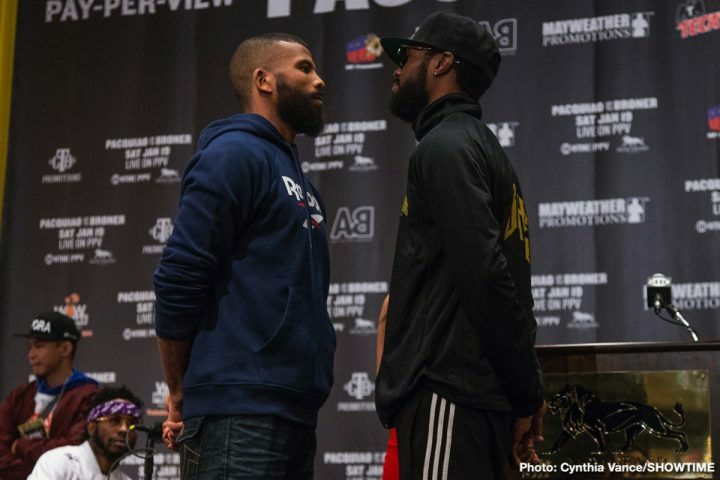 By Jim Dower: Former two division world champion Badou Jack (22-1-3, 13 KOs) and Marcus Browne (22-0, 16 KOs) will be squaring off for the vacant World Boxing Council Silver light heavyweight title this Saturday night on SHOWTIME pay-per-view on the undercard of the Manny Pacquiao vs. Adrien Broner card at the MGM Grand in Las Vegas, Nevada. The WBC has reportedly said that the winner of the Jack vs. Browne fight on Saturday will be the mandatory challenger to WBC light heavyweight champion Oleksander Gvozdyk (16-0, 13 KOs). Whoever emerges as the winner of the Jack vs. Browne fight, it’ll make for an interesting match-up when one of them faces Gvozdyk. Jack recently fought to a 12 round draw against former WBC 175 lb champion Adonis Stevenson last May in a thrilling fight on SHOWTIME. Stevenson recently lost to Gvozdyk by a 12th round knockout on December 1. The fight ended tragically with Stevenson collapsing soon after, and he needed to be rushed to a nearby hospital where he underwent brain surgery. The 41-year-old Stevenson still remains hospitalized. Browne, 28, is the younger fighter, but he’s facing a really tough opponent in 35-year-old Jack. Browne hasn’t fought anyone nearly as good as Jack, and he struggled in his fight three years ago against Radivoje Kalajdzic in winning a controversial eight round split decision. Browne was knocked down in round 6 by Kalajdzic, and he finished the fight poorly. It was a surprise that the judges gave Browne the victory. On Saturday, Browne is going to need to try and deal with Badou’s pressure for a full 12 rounds instead of just 8 like he did against Kalajdzic. It’s going to be a really tough fight. Gvozdyk was losing to Stevenson at the time that he stopped him in the 12th. The referee blew a call in the 11th round after failing to give Stevenson credit for a knockdown after he caught Gvozdyk with a big left hand shot that knocked him into the ropes. Ultimately, it didn’t matter, but the fact that Gvozdyk was losing the fight shows that he can be beat. Jack’s pressure would be a problem for Gvozdyk, and it would force him to fight harder than he would like. Gvozdyk will need to be a lot busier against Jack for him to have a chance of winning the fight. He’s not going to be able to count on winning the fight with a flurry of shots in the final round like he did against Stevenson. Jack will be ready for that kind of approach. Jack has noticed that Browne has been talking a lot of trash, speaking about him as if he’s not a threat to him. This type of trash talking is alien to Jack, as he feels that Browne hasn’t ever beaten anyone for him to be speaking the way he does. Browne is a good fighter, but his ability to handle pressure could be a problem for him when he gets inside the ring with Jack on Saturday. Browne will need to pace himself and conserve energy. If Browne runs out of gas against Jack, he’s going to get stopped. There are too many rounds for Jack to wear him down and knockout him out. This is an interesting fight. It’s unfortunate for Browne that he has to fight Jack for him to get a title shot. If Browne fought Anthony Yarde to earn a title shot, he’d have an easier time winning. Jack has a lot more experience than Browne in fights against a prime James DeGale, Anthony Dirrell, Nathan Cleverly, Alexander Brand, George Groves, Francisco Sierra. Rogelio Medina, and Marco Antonio Periban.